This chapter is a continuation of day five, this is the part 2, and in our previous chapter we reviewed and compared the three giant wordpress.org, wordpress.com and blogger.com. Let’s see the rest of them. a. Tumblr is a hip microblogging (if you don’t know what micro blogging means please refer to chapter one) hosted platform with a social network aspect. b. Tumblr is free of charge. c. Tumblr hosts your blog for no additional cost. d. Tumblr gives you a subdomain like example.tumblr.com. Connecting your own custom domain is possible too (you need to get the domain elsewhere). e. Tumblr Requires no skills at all to start and run a Tumblr blog. The interface is the most user-friendly one of the 15 blogging platforms we’re reviewing here. Tumblr blogs are easy to set up and easy to run afterwards. f. Tumblr offers lots of designs you can choose from, although many of them paid. g. Tumblr does not offer Plugins and extensions. h. Tumblr is great for Hobby bloggers. i. Tumblr is good for One-topic blogs. j. Tumblr is basically meant for Microblogs. k. Tumblr is good for Blogs publishing different types of content (quotes, posts, images, videos, etc.) . l. Tumblr is a social network as much as it is a blogging platform. m. Backing up your blog or importing it to other platforms is difficult. Medium Was Launched in 2012, it has grown into a community of writers, bloggers, journalists, and experts. It is an easy-to-use blogging platform with limited social networking features. a. Medium is free to use. b. Medium takes care of everything hosting. c. Medium don't offer custom domain name feature, everybody gets to publish under their profile (e.g. medium.com/@name/). However, quite recently Medium enabled its users to hook up their own custom domains to individual stories on Medium. Again, this means that individual stories can now use custom domains, not individual user profiles. d. Medium is extremely easy to use. All you need to do is sign up, and you can start publishing your stories/posts right away. No learning curve at all. e. Medium offers same design for everybody. f. Medium does not offer Plugins and extensions. Although Medium has some great publishing and typography features built-in. g. Medium is great for Writers looking to build their brand. Medium is great to get instant readership for your stories. h. Medium is good for Hobby bloggers. i. Medium is also great for Company blogs hosted outside of the company’s website. j. Medium does not offer the option of monetizing your content. When it comes to customization, Squarespace is a platform that offers a wide variety of options. The best part about customizing your blog on this platform is that you can change everything without knowing how to code. It is also a platform that lets your expand your services which is a great option if you are using your blog for your business. a. Squarespace is not free, it is Subscription-based, starting from $8-$24 / month. b. It is hosted for you after your subscription. c. Squarespace gives you a custom domain with your subscription. d. Squarespace is ultra-easy to use, even if it’s your first time building a website or blog. The interface is clear, intuitive, and powerful. Publishing new content is simple as well, and their custom Layout Engine lets you arrange your blog content however you like through drag-and-drop. e. Squarespace offers a number of great-looking and modern designs to choose from. f. Squarespace makes it a goal of theirs to always go with the trends and stay on top of what’s popular design-wise. g. Squarespace allows Plugins and extensions, a range of the most important features built-in from the get-go, plus there are external plugins available through another site. h. Squarespace is good for Business owners who need a great-looking and optimized website, and a blog to go alongside. i. Squarespace is great for Artists, musicians, photographers, creative in general who want to blog and also showcase their work in an effective way. j. Squarespace is good for Restaurants, cafes, and others running a company blog. k. Squarespace is suitable for Users with no design skills who want to be able to build a blog from scratch on their own. l. Squarespace offers 24/7 customer support. m. Squarespace offers the ability to monetize your content. Wix is a hosted platform for building websites. It offers an easy way for small businesses to build a website using drag and drop tools. You can also add a blog to your website by adding the Wix Blog app. a. Wix Has both free paid plans, Subscription starts from $0-$18 / month. b. Wix Offers hosting for both free and paid plans. c. You get 500MB storage and 1GB bandwidth with a free Wix account. e. Wix gives you a subdomain like example.wix.com. You can add a custom domain for $4.50/month. f. Wix is very easy to use when it comes to launching a new website. However, you do need to go through a couple of additional steps to add the blog module. g. Wix gives you a step-by-step wizard to get through the whole process. h. Wix has More than 500 designs available. i. Wix offers Plugins and extensions. There’s a number of essential site management features built-in, and apart from that, you can also extend your site through the Wix App Market. j. Wix is quite similarly to Squarespace, business owners who need a great-looking and optimized website, and a blog to go alongside. k. Wix is great for Users with no design skills who want to be able to build a blog from scratch on their own. l. Wix is good for Artists, musicians, photographers, creative in general who want to blog and also showcase their work in an effective manner. m. Wix is not a dedicated blogging platform. n. Wix offers the Ability to monetize your content. a. Joomla is extremely powerful and flexible, and can be used to build any kind of website or blog. b. Joomla allows you to choose from hundreds of templates to customize your site’s design. c. Joomla offers Extensions and Plugins (apps for your Joomla site) are available to add more features. d. Joomla community is much smaller than WordPress community, so there are fewer themes and add-ons than for WordPress. e. Joomla Support options are limited to community support. Paid support is hard to find and can be costly. f. You will be responsible for managing your backups, updates, and security. g. Joomla is great if you are looking for a full content management system. h. Joomla may have more of a learning curve than WordPress, but can be much easier to use than Drupal. i. Many businesses and large corporations prefer this type of platform because it can give you flexibility with a wide range of content options. k. Joomla is great for blogs that is attached to an existing business that already generates a profit. Ghost is a minimalist blogging platform with limited features focused on writing blog posts. It’s available as a hosted platform, and also as a software that you can install and host yourself. We’ll take a look at both options. a. Ghost downloadable software version is free. b. You can use their host, starting from $8-$200 depending on the number of blogs you want to run and the traffic volume you’re expecting, or use your own host. c. Ghost don’t give a domain with your plan, but you can connect an external domain easily. d. If you’re getting the downloadable version then setting up your site will take some time and skill around web servers and such. f. Ghost has a Markdown split-screen support and all. g. Ghost has nice library of themes to choose from, many of them paid though. There are also premium themes available on the web. h. Ghost does not offers Plugins and extensions. But things like SEO, social media, comments, etc. are already built-in. i. Ghost is perfect for Bloggers who want to use the newest and freshest technical solutions available. j. Ghost is great for Hobby bloggers passionate about web development. 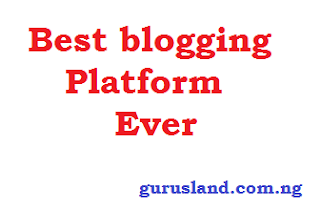 k. Ghost is good for Bloggers who like to experiment with new platforms. l. Ghost offers Fast optimization for SEO. Weebly is a hosted platform that allows you to build your website using drag and drop tools. It comes with dozens of ready-to-use themes that you can customize using their web-based interface. a. Weebly has Easy-to-use drag and drop website builder with no technical skills required. b. Weebly offers Quick and easy setup. c. Weebly host your site for you. d. Weebly offers free and paid plans, you can try out the service before buying the premium plan. e. Built-in features are limited and you can’t add new features. f. Weebly has limited integration with third party platforms. g. Weebly makes Exporting your site from Weebly to another platform is difficult. h. Weebly’s paid plans start from $8.00/month, and include limited features. i. To unlock all the available features, you could pay up to $49.00/month. j. Weebly has the ability to monetize your blog. Gurusland.com.ng is. Simple theme. Powered by Blogger.